Time for a Plant-Based Menu! I’ve often been asked lately why I thought it was time to create a plant-based menu. It’s a good question – and with Mexican food, one that comes with a lot of history. Prior to the arrival of the Spaniards to México, a plant-based diet was typical. For centuries, Mexican families made use of seeds, dried herbs, and plants to create meals. Corn originated in México, as did chocolate and a variety of other foods we now enjoy worldwide. The Aztecs, known for their bravery and ferocity, ate mostly plants. As a little boy in México, one of my favorite memories is from a magical afternoon spent with my Father as he worked on his small farm. I was only four years old, yet the memory is as fresh today as if it recently occurred. The afternoon sun tinted everything golden, and as I followed my Father through the dirt path the dust glittered in the light as it floated up behind his footsteps. I was there to ‘help’ him harvest corn. His work seemed fascinating to me, and I felt very grown up to be helping. My brother and sister tagged along, all of us listening with rapt attention to our Father’s words. We came to a fire pit with wood burning in the center and a rim of dry cow pies around the outside for fuel to burn the empty corn husks. Quickly becoming bored with ‘work’, I picked up a few kernels of corn and threw them on the fire. They popped and flew through the air, landing on the ground. Although a few burned up like small meteors, most remained edible and I reveled in the game of making food with fire. My love of popcorn, and later other traditional plants was born. Most of you know how great my Mother’s influence was in my decision to become a Restaurateur. She loved to cook and shared her love with us through her delicious dishes. She understood that to serve others through good food was more than simply providing sustenance. Much of the wonderful food she prepared for our family was Vegan or Vegetarian, though those terms were not used in those days. It was just good food, prepared with equal parts of tradition and love. Some of these dishes have always been on my menu at Mayahuel, but in the past year I have gotten more requests for plant-based dishes. It became clear to me that for those who choose to adopt a plant-based diet, it’s about more than simply food. My guests educated me with the reasons they choose this lifestyle; the avoidance of any food that contains animal products (such as dairy, eggs and honey) or are made with animals or tested on animals. Many of my guests are very careful to read labels and insure they aren’t contributing to the harm of other living creatures. This made me think. How could I find a way to support this life-choice? My Executive Chef, Maria ‘Coco’ Mondragon and I began to work on recipes that have a combination of historic tradition and modern-day inspiration. Certainly, many of the dishes that bring back wonderful memories from each of our childhoods qualified. We recently finished the menu – though it will continue to evolve and we’ll add items – and we’re pleased with the results. Some of the dishes are quite traditional – such as the Tacos Dorados de Papa, crispy, crunchy corn tortillas filled with smashed seasoned potatoes and topped with fresh lettuce and salsa. Another favorite in many Mexican homes is lentil soup. Lentils are full of nutrition – and lend themselves to the addition of herbs and spices that make a wonderful soup. Chef Mondragon and I wanted to create a delicious nutritional drink that would also be wonderful with the addition of fine Tequila. 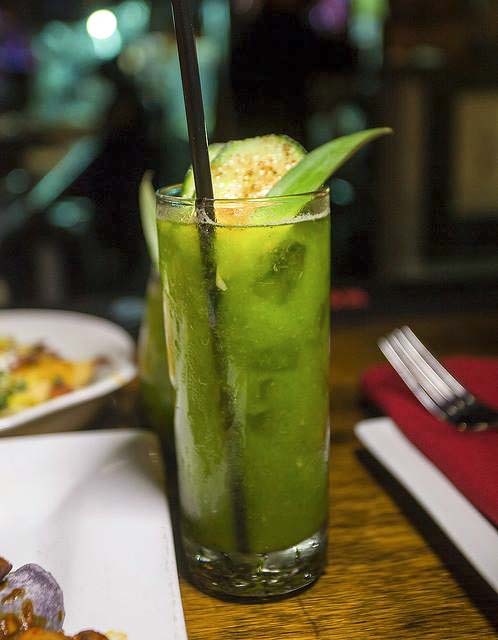 After trying several possibilities, we settled on a drink that includes fresh spinach, watermelon, mango and a touch of mint. This is a refreshing example of plants used frequently in Mexican drinks and dishes – and while it’s wonderful on its own, it makes an amazing cocktail when Tequila is added. The creation of starters was another area on which we focused our attention. We already feature the nutty, creamy Sikil P’ak, a dip made from roasted Pumpkin Seeds that is a staple of the Yucatan diet. 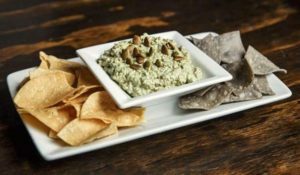 Adding the Chipotle Almond dip seemed the perfect second plant-based starter – a creamy blend of ground almonds and smoky Chipotle chile goes beautifully with our house-made chips. 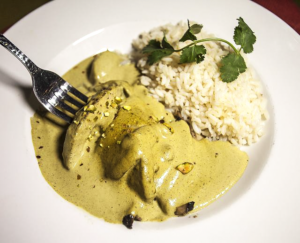 Mole – which is made throughout Mexico in dozens of delicious variations – is delicious over meaty Portobello mushrooms or Plantains. Our Pistacio Mole has a creamy, delicate subtleness with layers of flavor. Huitlacoche – a delicious Earthy mushroom/fungus that grows on corn – has been recently ‘discovered’ by some of the world’s top Chef’s. It lends a unique flavor to corn tortillas with mushrooms, black beans and fresh corn. Avocado – such as that in our Enchiladas Zapotecas – is a staple in Mexico and makes a very satisfying main ingredient. One of the courses we had the most fun creating was dessert. Caramelized Plantains with dark Rum sauce have long been served south of the border. The Chocolate Pistacio cake, however, was new. This turned out beyond our wildest imagination. No one would ever think this moist, dark, rich cake had no eggs or dairy. I’m excited about the opportunity to bring more diversity to my Restaurants and would encourage everyone – even meat eaters – to try some of our plant-based dishes. I’ll be modifying menus at each of my restaurants, including Mesa Mercado in Carmichael and La Cosecha Sacramento. It makes me proud to represent my culture through the passion of making traditional Pre-Hispanic foods. Her ability to ‘capture the power of words’ has earned Frederika Zylstra recognition from business owners across diverse professional areas. Extensive studies in neuromarketing as well as the psychology of linguistics and buying behavior has given her an understanding into how we analyze and perceive what we read. Unauthorized use and/or duplication of this material without express and written permission from this author and/or owner is strictly prohibited. Excerpts and links may be used, provided that full and clear credit is given to Frederika Zylstra with appropriate and specific direction to the original content. Congratulations to Chef Maria ‘Coco’ Mondragon! Welcome, Chef Eduardo Garcia! Mayahuel’s own El Tesoro Barrel Selection is Here!